Since iPhone camera keeps getting better with every new generation, there is always a tendency to be tempted to keep taking and storing photos all the time. However, with time, it starts getting clearer to users that the 32GB iPhone they are carrying will start running out of space and hence there will be a need to move iphone photos to PC. The essence of this will be to free up space on your iPhone iOS 12 so as to continue taking your favorite photos when the need arises. To put iOS 12 photos on PC and saving space is simple and that is what we will be looking at. It does not matter if you are using Mac or Windows operating system, Apple has made it easy for everyone. The following steps will be needed when saving photos from iOS 12 to computer. Use the USB cord to plug your iPhone to your PC. You can do this with a 30-pin USB cord or a lightening cable, whichever is suitable for you. The photos app should launch automatically. But if it doesn’t, go to the start menu or search bar and open the program manually. 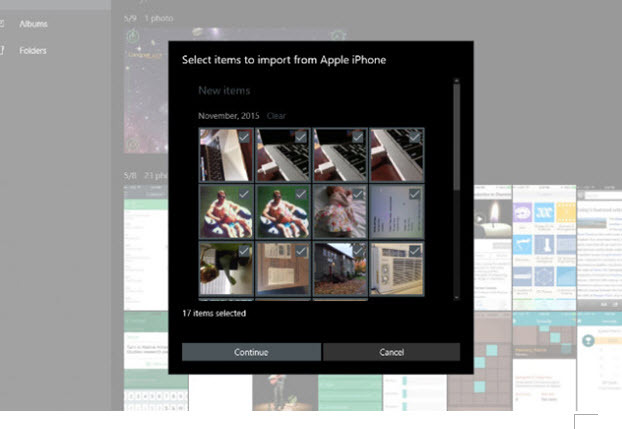 Click on “Import” and check the individual photos you wish to transfer to the PC from your iPhone iOS 12 and click on “Continue”. You can check the popup window to automatically delete the photos on your iPhone. There are other solutions to moving iOS 12 photos to save more space on iPhone. You can also transfer your iPhone photos to iCloud. However, transfer iOS 12 photos to PC or iCloud manually will be a little complex, even waist a lot of time if you're a new iPhone user. So the most simple but effective way is to use a tird party software to do it. Here we recommend iMyFone Umate iPhone Cleaner, who provide one click solution for iPhone photos. Clean 30+ hidden junk files with a click. Clear temporary files to improve iPhone performance. Auto detect and selectively delete large files over 5MB to free space. App manager - one click to mass remove unwanted Apps. 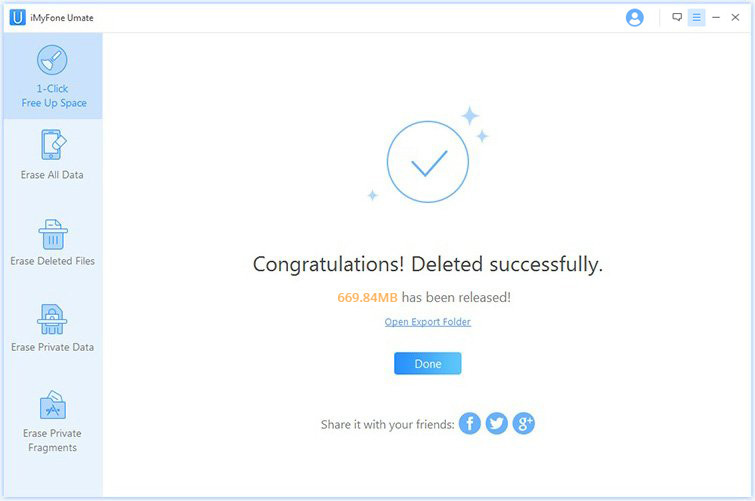 Data eraser - permanently erase private iOS data, 100% unrecoverable. This is one way to save space on your iPhone device. It is the most recommended for iPhone users. It is simple and the steps are straightforward. Before putting iPhone photos on PC, you should firstly downlaod iMyFone Umate Pro or iMyFone Umate Pro for Mac and install it. Step 1. Hit “Photos” tab in the interface of "1-Click Free Up Space" and click on “Backup and Delete”. Step 2. The iOS 12 photos will be arranged according to date, then select required photos and click “Start” to begin the process of deleting them. Step 3. After the process, see how much space is saved. Another powerful function of iMyFone Umate Pro is to compress iOS 12 photos. This can make all the photos stay on your iPhone, at the same time, reclaim 75% of your photo's storage. What's more, you will get a backup for your original photos on PC, in case that you maight want to keep them for future use. At the end of this process, there would not be any difference between the compressed photos and the original photos in terms of quality. The process is also simple. Check the required steps. Step 1. 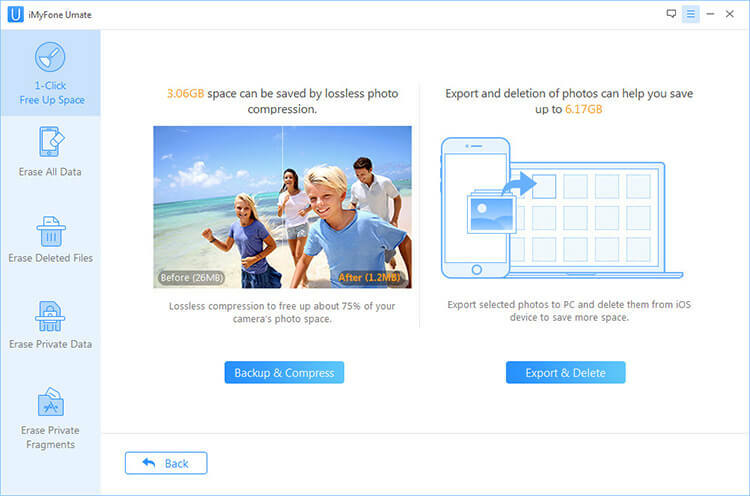 Click on “Backup and Compress” and all original photos are exported to the PC just to keep them intact. Step 2. Compression of iOS 12 photos starts freeing up 75% of your iPhone photo storage. Step 3. At the end of compression, see the storage space saved on your iPhone 7. Clean Photo Cache: Invisible photo cache will be created when taking photos. There is no direct way to clean them from iPhone. iMyFone offers you the all-in-one way to thoroughly clean all cache and photo cache is inclusive. It is free trial. Have a shot. Permanently Delete Photos: Manually deleting photos or through "1-Click Free Up Space" on iMyFone is not peramnent. Photos can be retrieved then. But you can choose to completely delete photos and make them 100% unrecoverable. Destroy Deleted Photos: Manually deleted photos which are under the risk of recovery can be found out and permanently destroyed. No trace of recovery will be left. 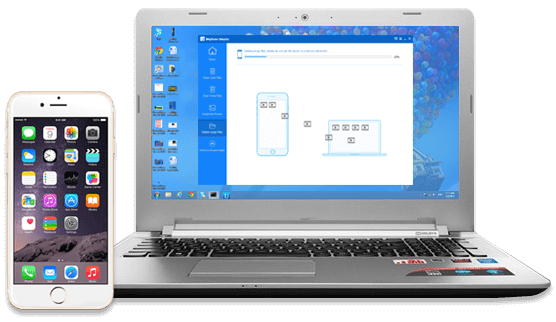 iMyFone provide free trial version for users, you can just download the sofware and try it. The downlad is totally free and secure!